Visit Dive Adventures for more information. Australia is the sixth largest country in the world. It's about the same size as the 48 mainland states of the USA and 50 per cent larger than Europe, but conversely has the lowest population density in the world, with only two people per square kilometre. With over 7,000 beaches, Australia's extensive coastline makes for an unparalleled diversity in terms of both land and ocean climates. From coral reefs, clownfish and giant turtles on the northern coasts, to the majestic whales, seals and fairy penguins off the temperate southern coasts, Australia truly is a scuba diver's paradise of immense and unique diversity. Approximately 15% of the Marine in the Great Barrier Reef is endemic to Australia. Conversely, the Temperate waters of Southern Australia is especially unique - 85% of the marine species found here are found nowhere else on this blue planet!!! The Great Barrier Reef is the major attraction for scuba divers traveling to Australia. The reef is the largest coral reef system on Earth. Many Australian live aboard dive vessels run day trips and weekly tours of the outer reef and Coral Sea Islands. Giant turtles, nudibranchs, coral polyps, pelagic and a variety of sharks all regularly appear on the Great Barrier Reef, providing divers with an awesome sight. A number of wrecks are also available to dive along the Queensland coast, including the Yongala. Lady Elliot Island and Heron Island are also highly noteworthy destinations. Adventurers and thrill-seekers will love cage-diving with Great White Sharks, up close in their natural environment. Their size and power will awe divers who are able to get within centimetres of these creatures, thanks to an enclosing steel cage. 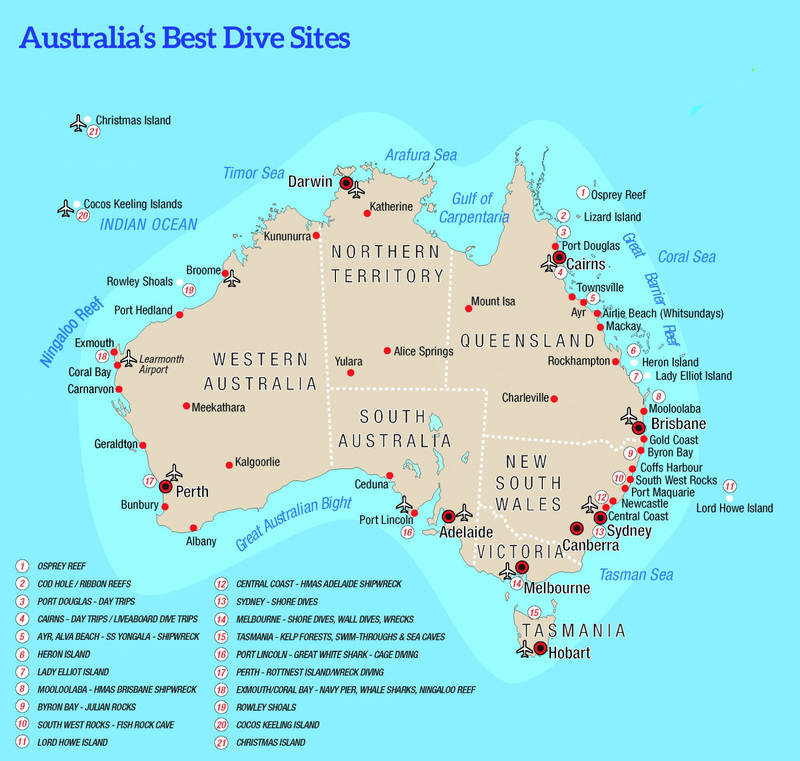 South Australia is also famed for the cave diving in and around the Mt Gambier Region. Ningaloo Reef and Rottnest Island are must see destinations for scuba divers or snorkelers. Ningaloo Reef near Exmouth is famous for the appearance of the enormous whale shark, as well as other seasonal visitors to Ningaloo such as Manta Rays, Dugongs and Humpback whales. Other major sights in this area include Abrolhos Islands and Murion Islands. While wreck divers will be attracted by the destroyers HMAS Perth and HMAS Swan. Rottnest Island, located near Perth, offers something for everyone. Divers will be left in awe with over 360 species of fish drawn to the waters off Rottnest by the Leeuwin current. Some 20 species of coral and 13 historic shipwrecks lie in the surrounding waters. Non-divers will love the boating, sailing, snorkelling available on more than 63 sheltered beaches. The relaxed atmosphere of the island makes Rottnest a great getaway destination. Like South Australia, Western Australia is also famed for cave diving on the Nullarbor Plains region. As far as scuba diving goes, Australia is a unique destination, with many remote and unexplored regions, forgotten wrecks and an enormously diverse array of marine life. Bicheno on the north-east coast of Tasmania is classified as one of the best temperate marine dive locations in the world. Famous for the underwater variety and colour. Visibility is typically 15 to 30m. Giant sea whips, sea horses, colourful sponges, zoanthids, large volumes of fish and migrating whales are just a taster of what this part of Australia has to offer. Lord Howe Island will celebrate its 35th anniversary of World Heritage listing in December, 2017. It is one of only a handful of island groups on the UNESCO World Heritage list, inscribed for its biodiversity and spectacular landscape and is home to hundreds of beautiful and rare plants, birds and marine species. The island was created by a volcanic eruption seven million years ago. It boasts a number of unique natural experiences including diving the world’s southernmost coral reef and visiting Balls Pyramid – the tallest sea stack in world. Two-thirds of the island is covered in natural forests, Banyan trees and Kentia palms. Lord Howe Island is situated 550 km east of Port Macquarie, New South Wales, Australia and less than two hours from Sydney, Brisbane and Port Macquarie airports. The Island is 11 km long and less than 3 km at its widest point. Island population: A paradise where only 400 visitors are allowed on the island at any one time and there are only 350 residents. The Cocos Keeling Island group is an isolated cluster of Islands located in the Indian Ocean about 2750 km North-West of Perth and 3685 km West of Darwin. The Cocos Island cluster comprises of 27 coral islands forming two atolls offering clear blue skies, beautiful white sandy beaches and a tropical climate. In short, the Islands are an idyllic setting for the holiday experience of a lifetime. Far removed from the hustle and bustle of mainland Australia, the Cocos Keeling Islands offers visitors a unique relaxing holiday. Christmas Island is a tiny island in the vast Indian Ocean; it is located 2300 km north west of Perth, Western Australia. Shallow waters with fringing reef surround the island, before plunging dramatically into the depths of the Java Trench. Caves honeycomb the limestone cliffs at sea level. These marine environments provide a visual feast for snorkelers and divers alike. Over 63% of Christmas Island is national parkland. Walking and driving tracks lead to many lookouts, beaches and freshwater waterfalls. It is a nature lover's delight. 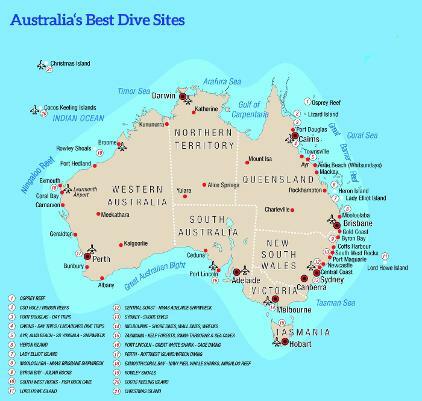 *NOTE: Much of the content on this page is sourced from and copyright of Dive Adventures Australia.